A colourful and delicious alternative to grilled meat, this also makes a good barbecue side dish. 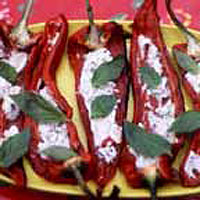 The peppers are roasted over the barbecue with the merest brushing of oil to prevent sticking, and then smeared with a little goat's cheese, blended with fresh basil. Slice the peppers in half lengthways and remove the seeds and membranes. When you're ready to cook, lightly oil the skin side of the pepper halves and place on the barbecue. Cook, pressing them down so they cook evenly, until the peppers start to soften and the skin begins to blacken - about 10 minutes. Turn over and cook for a couple of minutes more, then turn skin-side down again and smear the goat's cheese mixture on the peppers (about 1 tsp per half pepper). Cook for a couple more minutes to let the cheese melt slightly, then transfer to a serving plate, garnish with the extra basil leaves and serve.